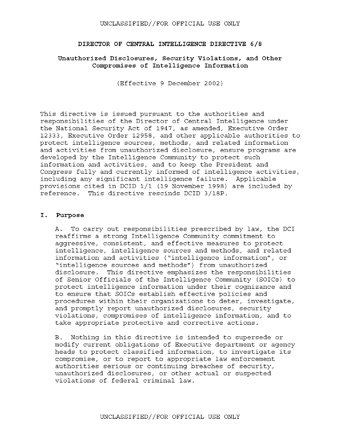 This directive is issued pursuant to the authorities and responsibilities of the Director of Central Intelligence under the National Security Act of 1947, as amended, Executive Order 12333, Executive Order 12958, and other applicable authorities to protect intelligence sources, methods, and related information and activities from unauthorized disclosure, ensure programs are developed by the Intelligence Community to protect such information and activities, and to keep the President and Congress fully and currently informed of intelligence activities, including any significant intelligence failure. Applicable provisions cited in DCID 1/1 (19 November 1998) are included by reference. This directive rescinds DCID 3/18P. Unauthorized disclosures of intelligence are a serious and recurring problem whose deterrence requires continuous security vigilance, thorough inquiry and investigation, and appropriately applied sanctions. The damage to US intelligence, foreign relations, national defense, and law enforcement interests caused by unauthorized disclosures, whether individual, cumulative, intentional, or unintentional, can be as great as that caused by espionage. SOICs must constantly take steps to vigorously deter unauthorized disclosures, to identify the persons responsible, and take appropriate corrective measures. d. Within their IC elements and in conjunction with other agencies as appropriate, utilize a full range of security, analytic, and investigatory resources to identify those who intentionally disclose or otherwise jeopardize intelligence information, take appropriate steps to sanction such persons who violate applicable statutory, Executive Order, or regulatory provisions, and take such other corrective steps necessary to prevent a recurrence of such disclosures. 2. Periodically review security programs, policies, and procedures under their cognizance in order to strengthen safeguards and update programs, policies and procedures as necessary in light of events, including changes in personnel, expanded interactions with the public, or emerging technological developments. 3. Develop procedures to ensure the appropriate protection of intelligence information by personnel engaged in collection, analytic, public information activities, or other interactions with members of the general public. Such procedures shall provide for relevant and timely guidance to reduce the likelihood of inadvertent or otherwise unintentional disclosure of classified or other intelligence information that warrants continued protection. a. As a condition for access to classified intelligence information under their cognizance, all individuals prior to being granted such access to classified intelligence sign appropriate nondisclosure agreements in accordance with applicable law and presidential directive. The agreements must address the responsibility to safeguard intelligence information that is classified or that is in the process of a classification determination, pursuant to law or Executive Order. b. Personnel are aware that the prohibition against unauthorized release or disclosure applies to individuals having former as well as current access to classified intelligence information. c. Upon termination of access to classified intelligence information, individuals receive an exit briefing. The individual’s signature will be requested acknowledging his or her continuing obligation to protect classified intelligence information and materials and to return any such information and materials in his or her possession. Refusal to provide a signature will not relieve the individual from the obligation to abide by the conditions set forth in the original nondisclosure agreement. Any individual who refuses to do so shall be so advised. Any individual who refuses to return classified intelligence information and materials in his or her possession shall be advised of applicable sanctions and reported to appropriate investigating authorities. Classified Intelligence. Intelligence information classified pursuant to Executive Order 12958, Executive Order 12951, or other applicable authority. 1. Foreign intelligence and counterintelligence, as defined in the National Security Act of 1947, as amended, and Executive Order 12333; 2. Information describing or otherwise revealing US foreign intelligence and counterintelligence activities, sources, methods, equipment, or methodology used for the acquisition, processing, or exploitation of such intelligence; foreign military hardware obtained through intelligence activities for exploitation and the results of the exploitation; and any other data resulting from US intelligence collection efforts; or 3. Information on Intelligence Community protective security programs (e.g., personnel, physical, technical, and information security). Responsible SOIC. SOIC with primary or sole authority to conduct an internal inquiry into the suspected violation or compromise. Senior Official of the Intelligence Community (SOIC). The head of an agency, office, bureau, or other intelligence element as identified in Section 3 of the National Security Act of 1947, as amended, and Executive Order 12333.